Following the tradition of its Dominican founders which focuses on the shared pursuit of truth, the Dominican College Community acknowledges that the earth has been entrusted to humankind and the responsible use of its resources requires commitment, action, and accountability. The design and planning of the Prusmack Center for Health and Science, which opened on campus in 2005, initiated the College’s focused efforts on developing and maintaining a sustainable campus. A geothermal system was installed as were lighting sensors in appropriate locations and laboratory equipment designed to use energy and water sources efficiently. The College was also able to use high grade recycled laboratory furnishings and some equipment donated by an international corporation whose global research and development center located in Rockland County was, at the time, undergoing a massive upgrade and renovation of its laboratory facilities. In addition, green infrastructure was pursued with the installation of a dry swale corridor to provide storm water management on the site of the new facility. As upgrades and new construction have occurred on the campus, energy star-rated boilers and other equipment have been installed as have motion sensors for lighting where they can be used without disrupting activities or creating security issues. Construction projects specify that environmentally-rated building materials and coatings as well as specific high E-grade windows, R-value insulation products, low VOC paints and carpet tiles are required. In addition, LED lighting upgrades have been made in outdoor and interior settings and a schedule for such installations will continue to be pursued. Low flow plumbing fixtures have also been installed in administrative buildings and are scheduled for installation in other facilities. The Food Services operations at the College utilize biodegradable products which are Styrofoam free and offer for sale reusable mugs and sports bottles which, when used, provide a discount on purchased drinks. New York State products are used whenever possible, not only for their quality but to reduce the impact on the environment involved in shipment. Local “Farmers Market Days” are hosted on site. In addition, a strict delivery schedule is in place to maximize delivery capacity and reduce unnecessary trips for small deliveries. Recycling efforts on campus increase each year. New receptacles have been placed strategically in all campus buildings which allow for separation of trash, paper and cans and bottles. Similar collection is facilitated by receptacles in outdoor settings. Collection of batteries, electronic devices, ink cartridges and other such items is facilitated by the Campus Facilities staff and brought to the county collection site. Digital signage throughout the campus provides reminders, updates, student-created slogans and other prompts to encourage a wide-range of recycling efforts. In addition, a recycling “fair” is held each year as students move out of residence halls facilitating the reuse of items either by other students or for distribution of such items by local charities. Efforts to reduce the amount of paper used in printing have been facilitated by a screen saver loaded on all campus computers urging users to consider alternatives. 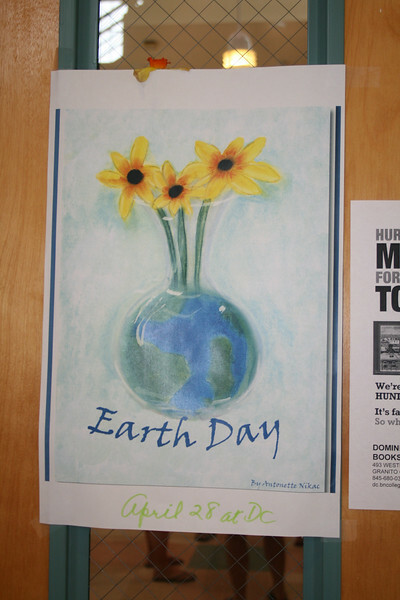 Earth Week is celebrated on campus each year to offer a variety of activities focused on environmental issues, to recognize the efforts of those who have contributed to environmental awareness and sustainability on campus, and to engage campus constituencies in community “clean up” activities both on campus and in conjunction with local groups. The efforts which have been described were initiated by the Campus-wide Sustainability Committee, formed in 2009, which includes administrators, faculty, staff and students and the more recently organized and student-led Earth Club. As the initiatives of these two groups have progressed, it became clear that Sustainability should be incorporated into the College’s Strategic Plan. An application was submitted to the College’s Executive Team for a grant to engage a consultant in order to assist in the development of such a plan. A Task Force, incorporating members of both groups was formed in the spring of 2013 and the resulting effort produced a five year strategic plan incorporating campus systems (campus planning, waste management, transportation and mobility, environmental health and safety), earth systems (energy and greenhouse gas emissions, water consumption, land use), administrative systems (finance and business operations, purchasing, food service, cleaning and maintenance), education and engagement (research and learning, active involvement, faculty and staff development, broader community collaboration). The Sustainability Strategic Plan has been developed to assure that the implementation of specific strategies will lead to outcomes that complement the overall effort while complying with the goals and objectives that have been established and set the stage for the definition and implementation of further stages.